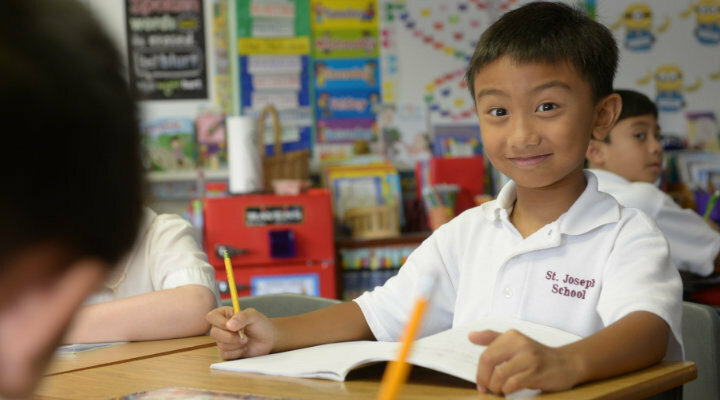 The Elementary School offers an academically rigorous environment that promotes learning through hands on lessons, differentiated instruction and a cross-curricular approach to enhance all content areas. All of the academics in the elementary school promote building good character traits within themselves as well as seeing the good in others. Technology is infused in all content areas. Language Arts- There is a strong focus on phonics, vocabulary, and reading comprehension in each of our differentiated groups. Various resources and novels are used to provide instruction. Math- The interactive curriculum incorporates manipulatives, partner work, and differentiated groups to help to promote number sense, skills and reasoning needed for problem solving. Religion- Students work on understanding and growing their faith. All students attend weekly Mass. Students in second grade receive the sacraments of Reconciliation and First Holy Communion. Social Studies - Students learn about Geography, Communities, U.S. History, and Maryland History. Handwriting- The Zaner-Bloser curriculum is followed to ensure that students are forming their letters and numbers correctly. Cursive is introduced in second grade and continues through eighth grade. Special Areas - All students attend Physical Education, Library, Computer, Art, and Music class every week. Spanish instruction begins in fourth grade. A variety of strategies and projects are used to teach the academic subjects. These include: analyzing, writing, memorizing, performing, summarizing, sequencing, interpreting, and critical thinking. Special activities include: creating stories, poems, book reports, essays, recitations, dramatizations, and dioramas. Specialized instructors in art, music, library, technology, Spanish, and physical education supplement instruction by classroom teachers. In language arts, students progress from basic writing skills to full expression, from the ability to read to a love of reading. They receive continuing instruction in grammar, spelling, capitalization and punctuation and are also exposed to increasingly challenging literature in a full range of writing styles, topics and cultures. In math, students develop number sense beginning with an emphasis on basic math facts. Manipulatives are used in mathematics to facilitate concept development and logistical reasoning, and to apply mathematics to problem solving. Grade by grade, students’ knowledge and skills become more sophisticated. Communicate that God is Trinitarian by demonstrating the Sign of the Cross. State that God made us to know, love and serve Him and to be happy with Him always. Understand that God is always available to us in prayer even when we are afraid. Understand that God has entrusted to all human beings responsibility for the world and its creatures. Begin to memorize and pray those prayers from the Catholic tradition including the Our Father, Hail Mary, and Glory Be. Identify the church as a sacred place where the people of God gather to pray and to worship God. Understand that our actions and words in every life situation should reflect that we are followers of Jesus. Define the meaning of faith as a gift from God that enables us to know God and follow him. State that the Old Testament tells of God’s people before the birth of Jesus. State that the New Testament contains the Gospels, the Good News of Jesus. Identify sacraments as signs of God’s love for us. Recognize Jesus’ presence with us in the bread and wine that become his body and blood. State that God gives us the ability and the freedom to choose right or wrong. Understand that we are called in a special way to care for the poor and the suffering. Recognize that there are three Persons in one God: the Father, Son and Holy Spirit that make up the Holy Trinity. Show an understanding of the Resurrection, that God raised Jesus from the dead. Identify and define the seven sacraments as signs of God’s love and the means to strengthen our relationship with God. Understand the Real Presence of the Risen Jesus in the Eucharist under the form of bread and wine. Express that we are given the gifts of free will and that our choices affect the lives of others. Explain that God created us to know, love and serve Him. Recognize the Commandments as rules God gave us because he loves us. Explain that people are called to forgive others and work toward understanding. Explain the major seasons of the liturgical (Church) year. Recognize conscience as a guide to distinguishing good and evil. Identify Mary as an intercessor for us with God. Articulate that all people are called to holiness by living their lives close to God. Describe the Holy Spirit as proceeding from both the Father and Son as perfect love and wisdom. Define sin as choosing to turn away from God and examine sin’s effect on our lives. Recognize the Mysteries of the Rosary are meditations on different events in the life of Christ and his Blessed Mother. Compose prayer from each of these categories: blessing and adoration, contrition, petition, intercession, thanksgiving and praise. Identify the Corporal and Spiritual Works of Mercy. Understand that the Church teaches that Jesus Christ is truly God and truly man. Identify and describe the major liturgical feasts and seasons of the Church year. Identify all human life as sacred and precious to God, made in God’s image and likeness. Understand that faithfulness to prayer and worship helps us to lead a moral life. Identify that the Church teaches that we must work for a more just and fair society and world. Work with equal groups of objects to gain foundations for multiplication. Making connections to the text. Greater emphasis on the writing process. Memorizes and recite address, phone number, and birthday. Fine motor control in order to draw, color, and print. Ability to hold pencil and crayon properly, control pencil and crayon and scissors, and color within boundaries. Ability to sit properly and hold the paper in the correct position for writing. Use reading strategies to determine central themes, develop understanding, identify and utilize various text features, determine key ideas and describe connections. Become proficient readers with the capacity to comprehend texts across a range of types and disciplines. Identify basic features of print such as the alphabetic principle, phonological awareness, phonics, decoding, and blending. Write opinion pieces, informative/explanatory texts, narratives and should participate in shared research and writing. Participate in collaborative discussions; communicate effectively using a variety of tools demonstrate efficient relay of information; and produce complete sentences appropriate to the task and situation. Use an inquiry process to locate, evaluate and use sources based on accuracy, authority, and point of view to explore a question/topic and synthesize and share findings and give appropriate credit/ citation. Select and use appropriate format to effectively engage the target audience in a topic, point of view, argument and/or creative work. Identify and define a problem-situation and work through a procedure to determine viable and appropriate solutions and next steps and carryout as applicable. Generate and develop ideas, solutions and connections to create something original/ novel that is meaningful or useful. Students will use text presented orally and visually to engage in collaborative discussions with peers. Students will learn to write in cursive, and will learn and apply spelling patterns and standard English language conventions. Using vowel digraphs and diphthongs. Compare and contrast historical fiction from various cultures. Understand the use of dialect within literature. Through reading a diverse array of literature and informational text, students are expected to analyze the structure of the text, compare and contrast, and refer to the evidence in the text, to interpret, integrate, explain, and describe their reading perspective. Students should show an ability to write informative, opinion and narrative pieces with clear and coherent writing. Using the writing process, students will develop and strengthen their writing skills. Research skills should be practiced over an extended period of time, using evidence from various text to support, analyze and reflect the research. Students should participate in a range of class discussions, posing specific questions, paraphrasing text and giving support for their opinions. Instruction should focus on correct punctuation, capitalization, multi-meaning words, and figurative language. Demonstrate a command of the conventions of standard English grammar and usage when writing or speaking. Summarize a written text read aloud or from information presented in a variety of media and formats, including visual, quantitative, and oral. Determine a theme of a story, drama, or poem from details in the text, including how characters in the story or drama respond to challenges or how the speaker in a poem reflects upon a topic and be able to summarize the text. Write arguments to support claims in analysis of substantive topics or texts using valid reasoning and relevant and sufficient evidence. Conduct short research projects that use several sources to build knowledge through investigation; additionally, produce more substantial research projects demonstrating understanding of the subject.